Home » Belize Travel Blog » Around AC » The Buzz: Bill Gates in San Pedro, Belize & Flour Tortillas…You Foil me AGAIN! The Buzz: Bill Gates in San Pedro, Belize & Flour Tortillas…You Foil me AGAIN! Yesterday afternoon a HUGE boat pulled up just outside the reef off Ambergris Caye. It’s honestly the biggest boat I have ever seen. It is ridiculous. Everyone on shore and on the Internet was abuzz with gossip…Jimmy Buffett? Oprah Winfrey? Beyonce and Jay-Z? Pictures like this were surfacing on Facebook…from the San Pedro Harbourmaster. Here is all I could see from the Royal Palms dock…and this was on 14x zoom. 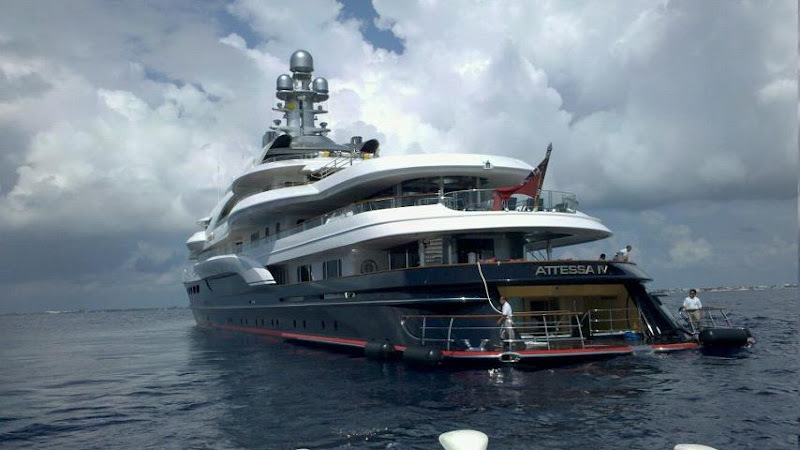 Who knew that the Attessa IV is 330 feet long (about the length of an American football field)! And worth a reported $250 million dollars? For a picture of Bill and his family, check out: Bill Gates on Board the Attessa IV in Belize. And what more would the Gates like to eat at my little soiree than fresh Belizean flour tortillas? Perhaps one of the most delicious (and unhealthy) foods known to man. I have tried to make them before. Estel’s Restaurant in town makes them thick, fluffy and delicious. Why, oh why, can’t I make them too? Well…because I just can’t. Every Belizean that I know has been making them since birth…and there doesn’t seem to be a real recipe. A spoon of this…a palm full of that…and then just knead until it feels right. Let’s try again…and I will list the recipe that we used so you can tell me what we did wrong. Mix dry ingredients in a bowl. Cut in the shortening with a fork or with your hands until incorporated. The flour should look like cornmeal. Add cold water and knead…if dough is too dry, add more a spoonful at a time. Knead dough until smooth. Cover with damp cloth for 10 minutes to rest. Divide into 6 smaller balls, knead a bit and let rest again in an oiled, covered bowl. Flatten on a plate or roll out. Cook in a hot, dry frying pan or better…on a cumal. A call to all Belizeans…what did I do wrong? My tortillas were tough, tough, tough…they didn’t rise properly. Not enough salt. I’ll never get these right. Or maybe the tortilla gods are sending me a clear message. It goes a little something like this: Stop eating flour tortillas, gorda. Yep! That’s the same yacht we were talking about last week on LocoGringo. We never could pinpoint the owner. Good to see she made it to AC. And thanks to your lovely picture of her back end we know the name “ATTESSA IV”. Plenty of info on her here. Largest in North America out of Vancouver BC. Thats some canoe ole’ Billy has. Oh,btw did Bill hook up with you at your condo to review your resume or treat you to ladys night?